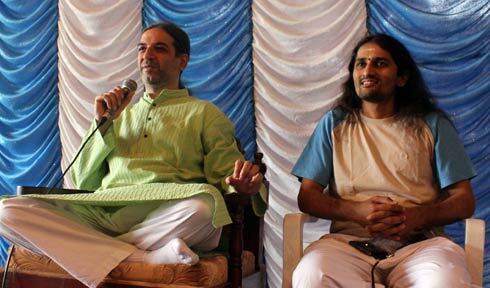 The day started with kriyas and after which we went out to see Bawa and Dinesh, the makers of YES+. The two hour session with them passed like 10 minutes. We kept asking questions and they kept giving us intelligent and funny answers. After that we rushed to meet Guruji. We waited patiently for him in a long queue and finally got inside a building. 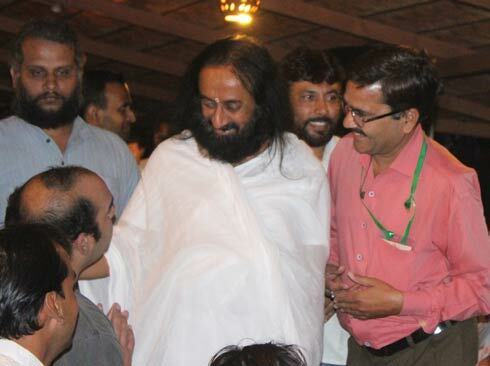 We were asked to sit in opposite rows and Guruji would pass in between us, showering his blessings. He came, He smiled and He left. The food at the ashram was awesome, the people gracious and the weather, supportive. We got to see the Sri Sri Ayurveda Panchakarma centre too, where usually visitors are not let inside. Got up in the morning when the bus sopped at a Gas Station and I got on a queue to use the toilet. Again, when my turn came, the water ran out. I got off the bus at Ankamaly and reached just in time for the exam, I had almost gone through the material once, and that was good enough. Exam was pretty ok.
All together it was a pleasant trip, made a lot of new friends, got to meet ‘the’ Guruji. After a couple of Photowalks, Aby proposed the idea of a Street Photography Exhibition and he made it come true! 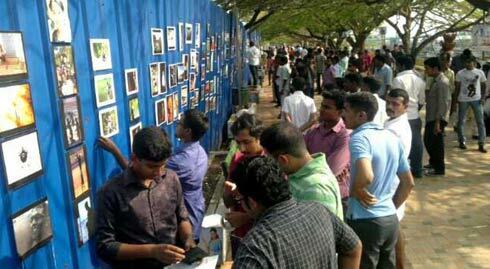 The stage was set, and we did it on the 19th, on the walkway behind GCDA complex, cochin. We had 18 amateur photographers showing off their pics, I took 4 of my shots to the streets. It was a fun day, Christmas vacations had just started and the people of the streets took us well. We were featured in Metro Manorama the very next day. So that was it so far, then it was time to pack up for Tata Jagriti Yatra. p.s: The post was written on train, during the Tata Jagriti Yatra. More details coming up. Hold on.